Turn a $5 Steak into a $50 Steak And How To Know A Steak Is Done! Summer has arrived and 4th of July is coming soon. A great day to put some big steaks on your grill. I found out about a method to turn a $5 Steak into a $50 Steak á la Versace and it’s pretty easy! I tried it out several times already and it works out great. My guests were always amazed of my steaks and they thought I spent a fortune on some really good steaks but the truth was, I bought some cheap steaks at Walmart. When I told them, they couldn’t believe it since it tasted like in a 5 star restaurant. 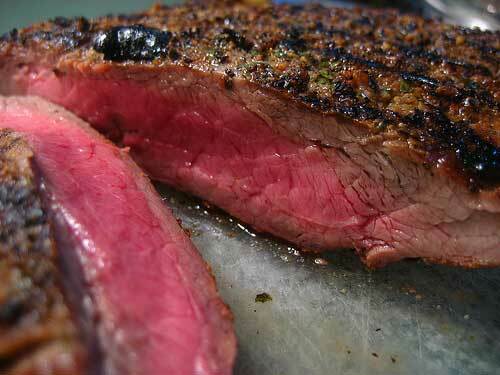 The secret is just simply, put massively salt on your steak for at least 15 minutes – 1 hour before grilling. 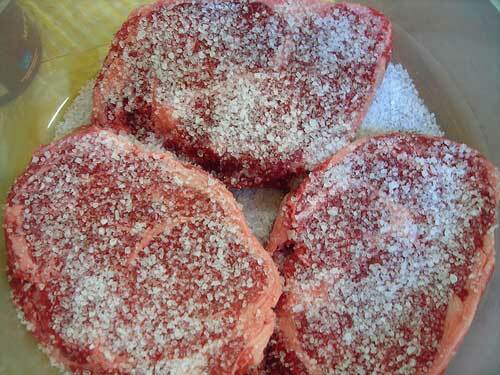 You literally have to coat the steak on both sides in salt, like in the picture. Depending on the thickness of the steak leave the salt on it for 15 min. – 1 hour. After that rinse and pat it very dry. I’m talking about very dry! And no worries, it won’t taste like pure salt, it will taste tender and juicy. less than 1″ >> 1/2 tsp/side >> 15 min. 1″-1.5″ >> 1/2 tsp/side >> 20 – 45 min. Use Kosher or Sea Salt, not normal table salt. Use steaks at least 1″ thick. For this method use NY Strip, T-Bone, Ribeye or Porterhouse Steak but no Sirloin. It works with chicken too. For a first trial, leave the salt a little bit less on your steak, it’s better to have it not so juicy and tender instead of having it completely salty, try it out what’s the best for your taste. Leave the salt at least 15 min. on your steak, it won’t work. The salt should be a little liquid after 15 min. or more. Who likes to have a special tasty kick, should also put some garlic, rosemary and other spices on it, while it’s coated with salt. When you buy the meat, don’t go for the red one with fresh blood on it, check out the brownish one. Of course, only if you plan to grill on the same day or the next day. 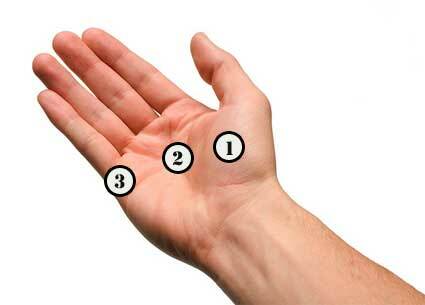 With your hand you can check if the steak is raw, medium or done. Just press the spots on the hand and compare it to the steak with a spoon to press on the steak. Rare, meat should feel soft and has little resistance to pressure. Medium, meat should feel firm, but still a little bit of give to it. The less give, the more well-done the steak will be. Well done, steak should feel firm, but has only minimal give to it. I wish everybody a great BBQ, beautiful weather and a great summer! Please comment about your experience with the salt method, would be interesting to hear from you and if you have more tips, please don’t hesitate to tell us! A most interesting tip. However, I am a little fearful of trying it out, given that I might get the saltiest dinner ever. I will try and persuade my beloved to attempt it. i love steak but unfortunately i dont know how to make a perfect one! and i think that this is gonna change my steak-eating life… the tips on how to tell if its rare, medium and well done is priceless..
Hey Lars, hope you can try it out very soon. I’m sure you will love it. Thanks for commenting on the website. Hope you will enjoy future posts. I tried this method last weekend and the steak turned out really well. It was a little salty since I left it on for 20 minutes, I will stick with 15 next time. I tried the touch method to see if it was done and that worked too. I always had to cut into steak to check, but this new way worked pretty well. Thanks for the tips! Hey Blake, good to know you trust me. Hope next time you have the perfect timing and leave it a little bit less on. Cutting the steak to check is always a flavor killer, it’s good to know the touch method. Here’s what I do for steaks under 1 inch thick – assuming they are @ room temperature (not cold) when you start. I have bookmarked your ’salt’ technique and will try next time we get thicker steaks. Hey Henrik, I will try out your tip too. Will see how that goes. Let us know when you tried out the salt method. Hey Red Roters, how did it turn out. Hope it was delicious. Yeah, in Argentina they just put some salt and basic stuff on their meat and it tastes great! I tried your suggestion and even though I would say I am a considerable salt fan, the steak tasted like brine, we couldnt even eat them. Im not sure what I did wrong but it was a total waste. Sorry to hear that Val, the only thing what could be, you put it too long in salt. Sometimes it’s a trial and error thing. If you try again, do it a little bit shorter and I hope it will work. Good luck! If it’s too salty perhaps it’s the kind of salt being used or very small grains (= more surface area = more salty)? I’ll try your salt method next timeI grill tenderloins. We usually but Harris Teeter Rancher which are cheaper but ok. Wish I had seen this before I marinated the ones I am doing tonight.